A very brief blog tonight before I head out for the evening. Since Christmas the service has run well and today, traffic was so light that the 08.35 from Peterborough came past me 8 minutes early into Wisbech. It must have been about the only vehicle on the A47 ! As on Christmas Eve there will be an early shutdown this evening. 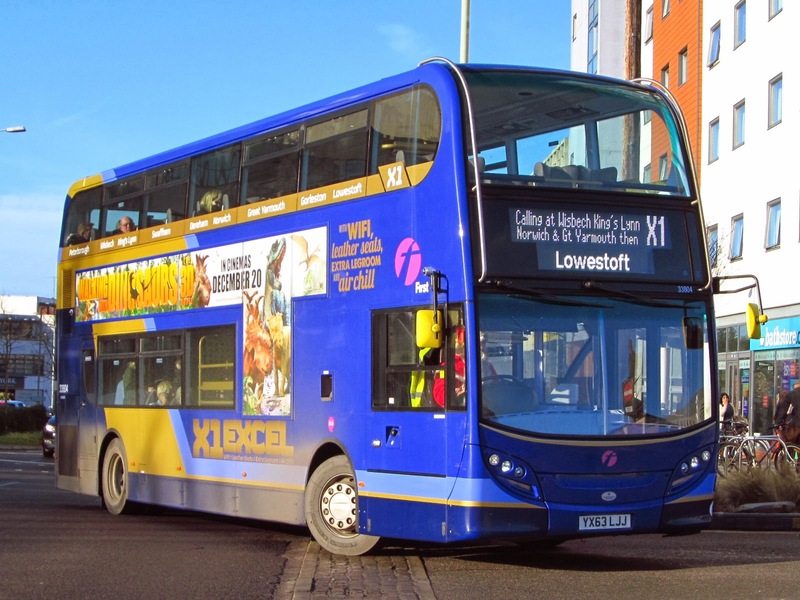 Diagrams K15 and K17 which normally finish at King's Lynn will again depot at Yarmouth and Lowestoft respectively, while K6 and L8 finish at King's Lynn instead of Lowestoft and Yarmouth. The new fleet have turned out to be pretty trouble free after the first couple of weeks and we will be keeping tabs on them and other X1 events throughout 2014. Thanks to everyone who has contributed to the blog in 2013 and for all your nice emails, here's to a great 2014 for you all. The build up to Christmas is always a busy time, but the X1 escaped relatively unscathed by the heavy traffic this year apart from on Monday 23rd. Going back firstly though to Thursday last, which was quite a good day, although an accident at Honigham in the morning delayed Y11 07.15 from Lowestoft which left Wisbech westbound 22 late with 33817. I was away on Friday, but from some point K5-XL11 was taken over by 33423. I had an evening journey from King's Lynn to Walpole on Saturday with 33810 which was slightly late, but nicely warm and comfortable on the 19.53 to Peterborough. Monday was the worst day by far due to excessive traffic. Peterborough was badly affected from the times the shops opened. L8-XL14 09.50 Wisbech to Peterborough with 33823 left just 4 late , but eventually returned 23 late. Y9-XL15 was 7 late with 33818 and 15 late coming back, but then things deteriorated. 33810 on L10-XL16 was 15 late to Peterborough and 46 late returning. Later L12-XL18 and Y13-XL19 both passed Bruce within 5 minutes of each other heading east at 14.50 & 14.55, 74 and 49 minutes late respectively. Not surprisingly there were numerous vehicle swaps at King's Lynn to maintain timings on the eastern section. 33809 was involved in a slight accident at Dereham in the afternoon which resulted in some small damage to the passenger side rear. This may mean a trip to Full Circle for repair. 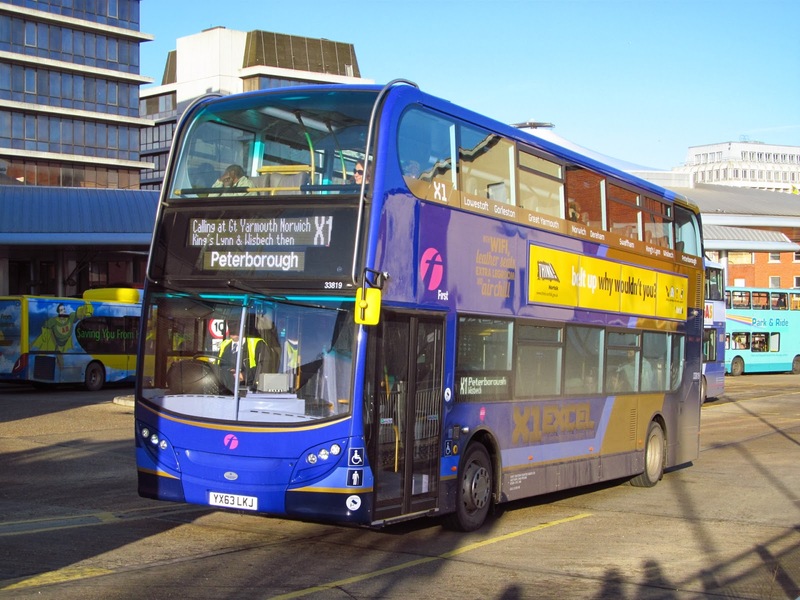 Up until this point, 33809 had been the highest mileage Enviro 400 having run just over 29,000 miles. Today, Christmas Eve, 33423 appeared on L12-XL18 07.45 from Lowestoft and it seems it may have travelled east last night following the disruption, rather than having come on to the turn at Lynn this morning. Traffic levels today were light with no instances of late running noted. 37571 is now the only Gemini remaining at Full Circle for repainting and Malcolm noted 37565 at work on the X2 today. Best wishes to you all for a happy and peaceful Christmas. As I reported last night the Stagecoach buy out of Norfolk Green was officially confirmed around 7am this morning. 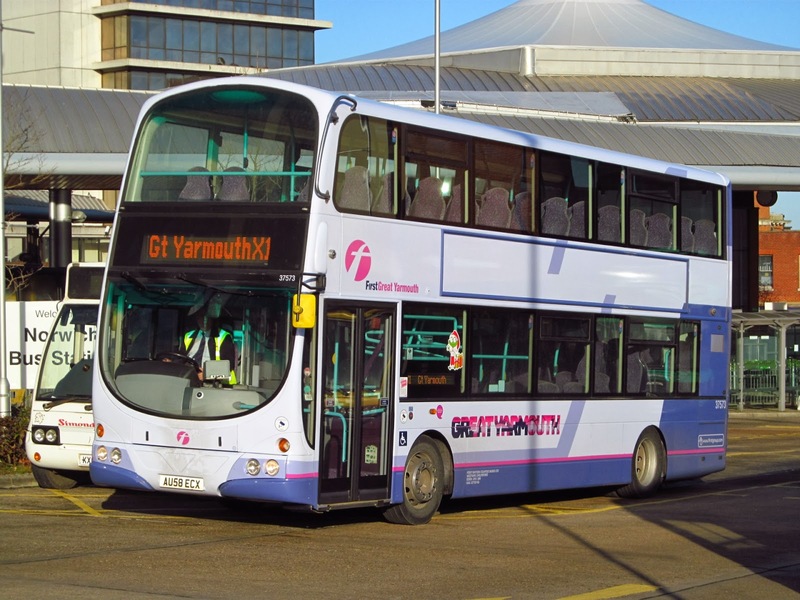 It is all like a big game of chess really, I daresay 'First' probably knew when they allowed Norfolk Green to take the King's Lynn local and town services off their hands a couple of years back, that a future takeover would leave Stagecoach as the main contender. Runours had been rife for several months, firstly Go Ahead were said to have tabled an offer to enable them to expand their growing empire in the East, then 'First' were said to have offered £5m and now Stagecoach have jumped in with a bid allegedly in the region of £10m. Hopefully the X1 will remain with 'First', although the likelihood of a competing Stagecoach service would now seem inevitable. Back on the route, the last week has passed off relatively well with just an odd A47 delay here and there. The leader in the mileage stakes for the Enviros is still 33809 and its already considerable tally was added to heavily last week when it did the 'long diagram' (K14-XL01) every day from Wednesday to Saturday. This stint alone would have amounted to another 1860 miles. 33809 has now completed 27,300 miles in traffic in under 3 months. The 12th (Thursday last) was an interesting day for a number of reasons. 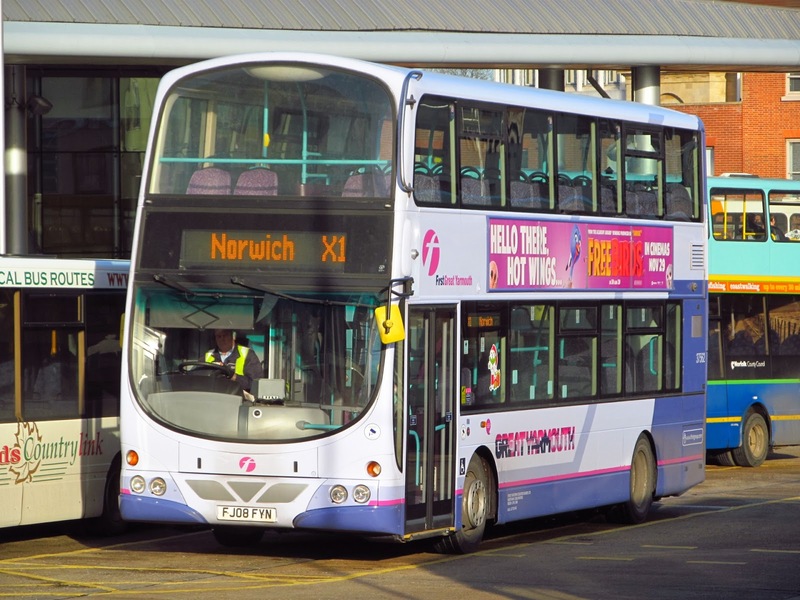 Malcolm reports the following Lowestoft sightings : 33805 departing 17 late on the 09.30 to Peterborough (K15-XL02), 34155 on the 09.25 X2 from Norwich and coach 20515 on the 13.25 ex Norwich. Former X1 Gemini 37564 was noted for the first time and this worked the 15.15 X2 to Norwich. Over at King's Lynn, a driver shortage meant the 10.00 to Peterborough was cancelled and passengers had to wait for 33812 on Y11-XL17 , the 10.30 departure. At teatime, the 16.46 King's Lynn - Lowestoft didn't run for the same reason. 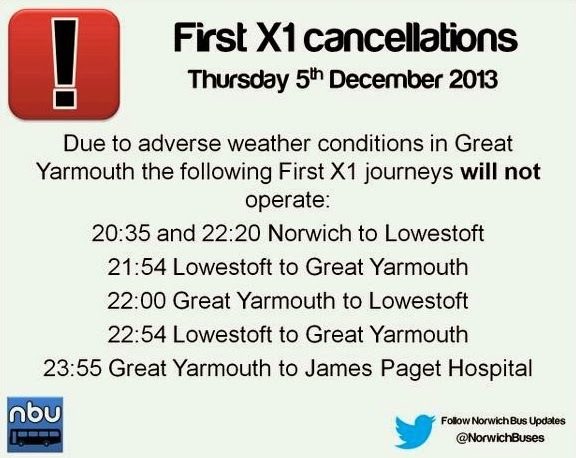 Des reports an incident packed journey back eastbound : "I was driving the 17.25 South Gates to Yarmouth (K19-XL06). we had a full passenger loading following the cancellation of the 16.46 service. I then became aware of an RTA between Fair Green and Station Road at Middleton. A passenger phoned her husband to confirm the accident was not blocking the Station Road junction, so I turned round at the Fair Green turn and stopped in the layby before Hardwick to sort out passenger requirements. With the 16.46 not running there were several passengers for Middleton, East Winch and Narborough, so I diverted via the A149 and came into Middleton via Station Road. We were 49 late at East Winch and our Yarmouth arrival was at 20.19, 39 late. I didn't pick up many passengers as I presume the bus behind diverted via A10 and leap frogged in front of me. As he was the 17.46 and the last Eastbound bus was at 16.11, he must have had a few passenger problems to put up with!!!" Gosh and all that on Thursday 12th rather than Friday 13th ! Friday itself was a calmer day and with few buses running late despite the heavy pre-Christmas traffic. Mind you, first thing the 07.30 from Peterborough, normally a banker for being on time was seen at Walsoken 14 late with 33807. Mid morning all was well until Y9-XL15 which passed me by with 33813 running 18 late. That was it though as regards delays until K3-XL09 16.20 from Lynn to Peterborough which 33803 operated running a similar 18 minutes late. At Lowestoft, Malcolm saw another new arrival on the X2, 37567 was working the 14.35 to Norwich. 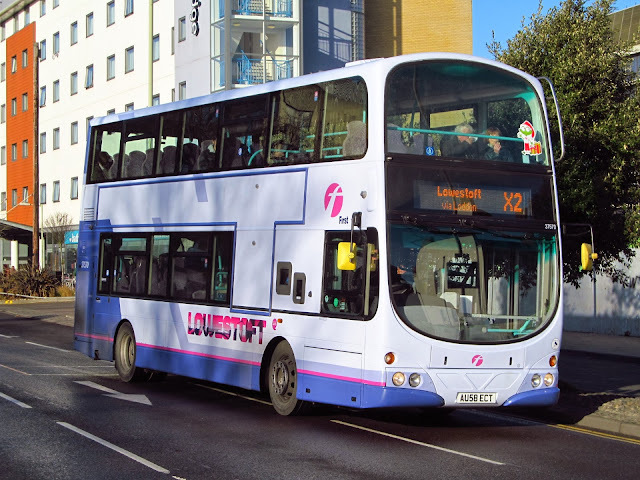 Heavy evening traffic resulted in the 13.30 Lowestoft - Peterborough arriving in King's Lynn 16 late and further congestion affected the 14.30 service which finally managed to get away from Lynn for Peterborough at 18.15, 25 minutes late. All this had been regained however, by the time King's Lynn was reached on the return. Taking advantage of the fine weather on Saturday, regular contributor Grahame Bessey has kindly sent us a gallery of pictures to brighten up the blog. He adds "very cold so it was off to The Bell for a couple of Pints of Woodfordes Bell Ringer to warm up, after a couple of hours with the camera!". Don't blame you Grahame, wish I'd been there to join you, rather than at work. Another former X1 Gemini devoid of advertising but with a repositioned elf - he's now on a downstairs window ! 37573 in Great Yarmouth branded livery working an X1 short on Saturday. Photo copyright : Grahame Bessey. 33821 captured by Grahame leaving Norwich for Peterborough on the 10.00 ex Lowestoft. Remember this bus ? Often used as an X1 loan vehicle in years gone by, 37562 now finds itself in the regular fleet based at Yarmouth and is here ready to work on a X1 short. Photo copyright : Grahame Bessey. 33819 returned to traffic on 11th December following collision damage repairs, here Grahame snapped her departing westbound working the 11.30 ex Lowestoft with Mr Saban at the wheel. 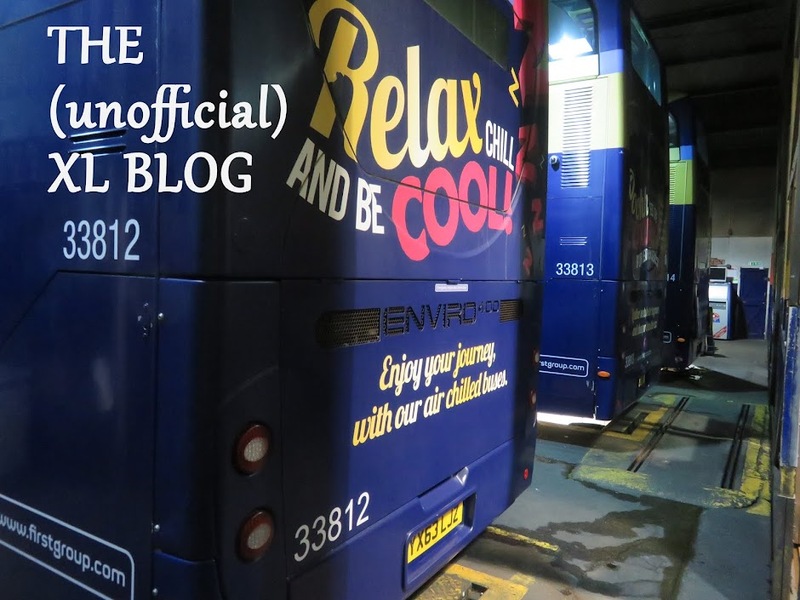 Thanks to Grahame for sending this selection of photographs to the blog. 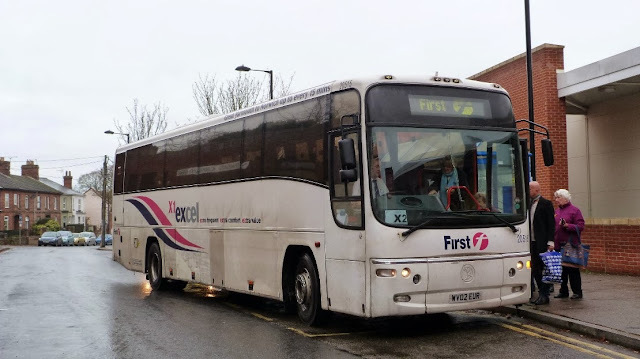 Sunday was a quiet day as usual, but on Monday coach 20514 was seen out on X1 shorts again by Jamie Skinner - blimey just when you thought they had finished as well ! Two Enviro 400s were removed from traffic today which is very unusual. 33817 working Y11 07.15 from Lowestoft was in trouble on arrival at Peterborough and Lynn produced 33803 tp replace it on the 13.30 King's Lynn - Lowestoft. 33805 was also withdrawn temporarily after it had arrived in Lowestoft on K3-XL09 as it needed a new tyre. On Tuesday temporary lights between Toftwood and Dereham caused minor delays. Timekeeping on Tuesday and today (Wednesday) has been exceptionally good for the time of year. Finally 33806 has not worked since Friday due to a wiring problem. I will try and produce another blog before Christmas, time permitting. It has been revealed today that Stagecoach have bought out Norfolk Green . 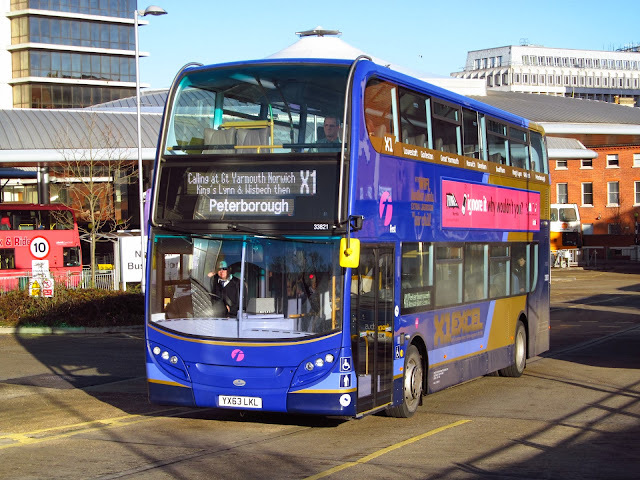 This being the case, it would seem that 'First' may be in for some competition on the X1 route, however, some sources are saying that Stagecoach want to actually take over the running of the X1 and that negotiations in this direction are already underway. Time will tell of course, but it certainly looks like we are entering a period of change in East Anglia. watch this space for further updates. The weather has played a large part in the proceedings X1 wise since my last post. 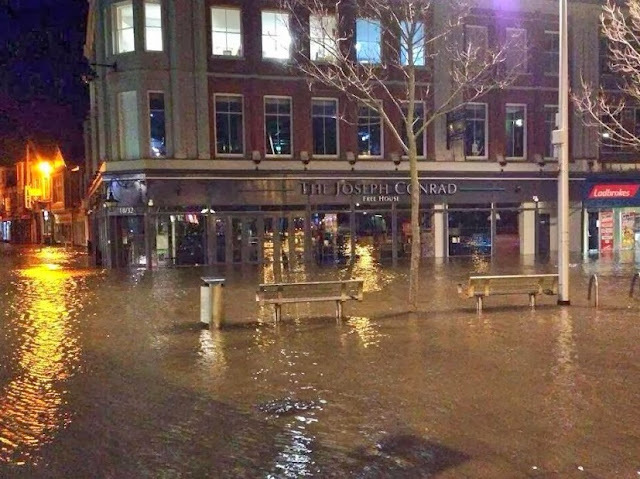 The high tides on Thursday evening resulted in evening services being curtailed and wisely so (see below) , since Syd reports large swathes of Lowestoft town centre under water after midnight. In fact he was involved in shifting the Lowestoft fleet to the higher ground of the bus station during the evening. The tide reached the top of the bridges at Wisbech too, but only minor flooding occurred here on South Brink outside the White Lion Hotel. Nevertheless, the police did have to shut both North and South Brink for a while around high tide at 20.00. Fortunately incidents on the route have been few and far between and the Enviros have continued to operate in a reliable fashion. 33819 is still at Full Circle being repaired and the other damaged bus, 33813, is now back in service although operating minus its rear vinyls for the time being. On Thursday 33814 had to be taken off K1-XL07 for repairs and 33423, still in its characteristic white livery took over. Friday saw the return to traffic of 33813 (see above) but it only worked the first half of diagram K17-XL04 and was replaced at 13.45 by 33818. 33423 was deputising on K3-XL09 commencing with the 06.37 King's Lynn - Peterborough. The so called 'stealth bus' then had some rest before being called upon to work K5-XL11 on Tuesday. On the punctuality front, Thursday was very good with only L10-XL16 running late of note, 33817 being 19 late from Wisbech on the 10.48 to Peterborough. Friday went remarkably well with only the Swaffham - Peterborough turn running late, 33818 had managed to lose 15 minutes by Wisbech and this hadn't been regained by the time it came back eastbound. I kept a low profile over the weekend when things look to have run smoothly. 33804 was out of traffic at this time awaiting a new windscreen. Monday was a good day with everything on time at the western end of the route, but Tuesday morning witnessed a string of late departures because of an A47 incident further east. 33803 working the 09.18 Wisbech - Peterborough (Y7-XL13) , a service which enjoys excellent punctuality due probably to it being off limits for the senior citizens free passholders, ran 17 late with 33803. L8 following managed to appear on time, but Y9 and 33805 ran 15 late and L10 following was 19 late with 33824. Things then improved and the rest of the day was OK here, however some late running was also noted in Lowestoft. In the morning 33812 was 14 late arriving on K16-XL03 which then forms the 10.00 westbound and in the afternoon 33805 on Y9-XL15 was 20 late in reduced to 5 late departing on the 16.00 to Lynn. At 17.20 I saw 33823 on K4 running around he block formed by Hall Road and School Road at Walpole Highway as the main road through the village was blocked by an accident, supposedly caused by the fog. To bring us up to date, Wednesday was another foggy day, though services through Wisbech ran very well to time, even though this was not the case further east. A few regular travellers were bemoaning the poor punctuality of peaktime services through Norwich, but what exactly do they expect given the nature of the route and the heavy pre-Christmas traffic ? Have a look at the X1 Twitter feed to see what I mean. Wednesday morning services were hampered by an RTA on the Acle Straight. King's Lynn acted quickly to minimise delays on the western section and when it became apparent that 33806 on Y9 06.41 from Gorleston was not going to make anywhere near its scheduled departure time of 09.40 to Peterborough, 33423 was summoned and worked the service instead. 33806 then departed for Peterborough as L10-XL16, 33815 the incoming bus dropping a turn to become Y11-XL17 and so on. Y13-XL19 was the first turn to run through unchanged. Des was in the thick of things and reports " 33823 Y11 - XL17 07.15 Lowestoft as far as Lynn South Gates. On time till Acle (08.21), Queueing to Blofield and via A146 into Norwich, depart Norwich -29 (09.19). Made up 10 mins by Dereham, had to unload a large perambulator, so had to pull tight to a No. 8 sitting on stop to get to the kerb. I've done this before and usually a quick reverse and pull out will suffice. however, a No. 4 pulled tight behind me ! So I was wedged between an 8 and a 4 for 9 minutes.- No time made up. From Lynn the bus worked as L12-XL18". Moving away briefly now from the X1, Malcolm Hicks has been monitoring Lowestoft services as usual with some unusual workings noted. On Thursday Palatine 34155 was operating an X22 service, while 37563/6/9/70 were all in use on the X2 along with 32655, 30900 & 30901. Friday saw more X2 variety with 34110 putting in a shift along with 34155. This may have been to counter the transfer away of the last of the 326xx series of ALX400s, as 32655 has finished working the route now. 37574/7/9 were all viewed on services 1 & 1a to and from Martham. 34155 enjoyed a final (?) X2 fling on Saturday and coach 20515 was also noted. Monday saw another noteworthy working, Lowestoft town service 103 being graced with the presence of ALX400 30901. 34155 had been relegated to working one of the Bernard Matthews contracts, but just when you thought it had gone, it popped up on the X2 today (Wednesday) working the 09.25 ex Norwich. Surely now in their final days on stagework ? Here is 20515 performing on the X2 recently. Photo copyright : Zak Nelson / NBP. 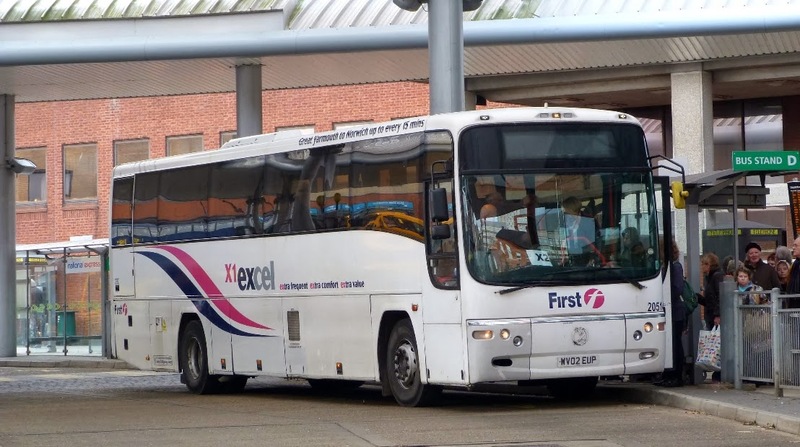 Sister coach 20514 loading at Norwich bus station on an X2. Photo copyright : Zak Nelson / NBP. www.greateasterntransportfilms.co.uk . Sounds like a good stocking filler for bus enthusiasts to me. 33810 passes Walpole Highway working Saturday's 08.15 Lowestoft - Peterborough. From a mechanical point of view, the new Enviro 400 fleet seem to have settled in well now and a few of them have now passed the 20,000 mile mark. Changes of diagram are currently quite uncommon and if a maintenance swap is required it tends to feature K6-XL12. This turn runs light to Swaffham and then runs in service to Peterborough to form the 09.35 eastbound departure. What tends to happen is that the 09.35 then changes vehicles at King's Lynn with a freshly serviced bus going forward and the one coming off then going to the depot for the same treatment. Thursday last saw a morning hiccup with Y9-XL15 and 33823 departing Wisbech 4 late on the 10.18 to Peterborough, but there was then a long gap of 56 minutes before 33818 went west at 11.20, followed just 2 minutes behind by 33824 on Y11-XL17. Last week ended fairly well with minimal delays. Monday though was a different story with a morning rush hour accident on the A47 near the Pullover roundabout which then temporarily closed the road as far as Tilney. Traffic was diverted via Tilney All Saints for a time with the result that K5-XL11 07.37 King's Lynn - Peterborough left Wisbech 46 late with 33821. Tuesday was considerably worse with yet another broken manhole between Thorney and Guyhirn causing single line traffic for much of the day. Morning punctuality was awful on the eastbound run, the only saving grace being that once buses exceed 30 minutes late, the public are unaware how late the bus actually is. Coming back east, 33808 on K3-XL09 08.05 ex Peterborough got to Wisbech 39 late. K4-XL10 was 52 late with 33803, K5-XL11 was a whoppng 73 late with 33805. K6-XL12 evaded me, may be going non-stop to King's Lynn to make up time, but Y7-XL13 with 33812 lost very little time being 3 late westbound and 20 late returning. After a long gap 33806 on L8-XL14 came in 53 late before things gradually improved. Wednesday saw a return to a largely unhindered service, although L10-XL16 10.48 Wisbech - Peterborough ran 17 late with 33809. Sunday rail replacement buses ran between King's Lynn and Downham Market (?) and 33808 was on standby at the rail station, though it doesn't seem to have been used. Accident damaged 33813 is already back at King's Lynn repaired, but is awaiting application of some new rear vinyls before it can re-enter traffic. 33819 currently remains at Full Circle. Thanks to all who have enquired about the feature (now well overdue) on the days of the 794 and X94, I hope to have this ready very soon.